My friends Yvette and Ken celebrated their 25th wedding anniversary last weekend. 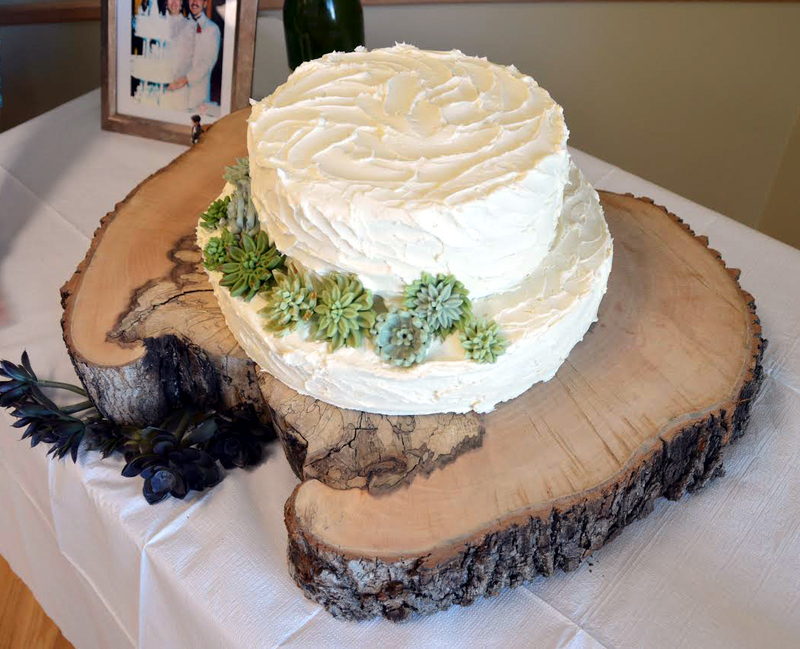 Their theme was “sun-kissed and windblown.” Centrepieces were locally procured driftwood filled with succulents. I was entrusted to do the cake. Simple. Feed 70 or so guests. Keep with the theme. The challenge was the succulents. I had a heap of fun making them out of fondant in 33C weather with 90 per cent humidity. I solved the problem by adding a bit of Tylose powder to the fondant and then popping them into the dehydrator. Magic! Ken cut the slab from wood that Yvette saw lying in someone’s yard. The tree had just been taken down, so she rang the bell and asked the lady if she could have a chunk for her cake. Yes! Then Ken sawed it into the perfect cake base.The cake was a hit! The party was fun. Congrats to the amazingly happy couple.